INTRODUCTION: Bangladesh being situated in the monsoon area of the world is a good treasure of indigenous plants of various families and they are grown widely in forests, jungles, hillocks and gardens. More than 550 plants have so far been identified to have medicinal activity1 and newer plants are being identified every year. Different segments of the plants such as roots, stems, leaves, barks, flowers, seeds etc. may be an interesting and important research area for the natural product chemists 2. These segments are used directly by the Hakims, Kabirages and Vaidays as the medicine of various diseases, since the ancient times. But they are using the different parts of the plants without having enough scientific knowledge on them. Actually they do not know what are the constituents contained in the plants and which constituents are responsible for the cure of the diseases or possesses harmful effects for the body. A number of plants used by the Hakims, Kabirages, and Viadyas may contain toxic constituents which have some health hazard associated with them and may sometimes cause serious sufferings. In this situation the thing, which is important to be done is that, the natural products 3 chemists should come forward to go through a systemic investigation on the available plant resources. Here one thing is very encouraging to be noted that our country abounds with a vast majority of medicinal plants and herbs. The availability of medicinal plants demands a systemic investigation on the isolation, purification and characterization of physiologically 4 active principles which are actually useful for the treatment of various diseases, but unfortunately no such systemic investigation has yet been undertaken in Bangladesh. There is no doubt, a number of chemists are engaged exploring the active principles of various plants which are reported to be used in traditional system of medicine but this is an unplanned way. Keeping all these in mind, the present workers intended to engage his efforts on piper chaba a medical plant available in Bangladesh, to go through a systemic study for isolation and analysis of the chemical constituents5 as well as the anti-microbial activity of the extract, so that the isolated constituents may be used for the welfare of the mankind. In view of the reports on the plant piper chaba it appeared that, a systemic study on the plant may give some interesting results which will be helpful to the common people of the country like ours. Therefore, the present work had been undertaken with a view to carry on a systemic chemical investigation as regards to their isolation, purification and structural elucidation of the chemical constituents of the plant terminally piper chaba hunter. The anti-microbial activity of the extract will also be examined. The plant chui (piper chaba) was collected from rajshahi district (Motihar Thana) during June-July, 2009. A voucher specimen of this plant was deposited in the Herbarium of the Botany Department of Rajshahi University. The leaves and stem of the plant were separated and cut into small pieces and dried under mild sunlight and then at 40°C in an oven. Afterwards the plant materials were powdered separately by grinding machine. The powder was used throughout the investigation. The powdered (1047 gm.) stem of piper chaba was extracted with methanol (3500 ml) for 15 days at room temperature with occasional shaking and stirring. If was then filtered through a whatman no.-1 filter paper. The volume of the filtrate was then reduced using a rotary evaporator at low temperature and under reduced pressure to afford greenish solid as a crude material. The weight of crude extract was 25.4 gm. Test of alkaloids: A few drop of Mayer’s reagent was added to 1 ml of acetic aq. Extract. Formation of white or pale yellow precipitate was due to the presence of alkaloids. Test of carbohydrates: 0.5 ml of aq. Extract was added to 5 ml of benedict’s solution and boiled for 5 minutes. Formation of colored precipitate was due to the presence of carbohydrates. Test of flavonoids: 0.5 ml of alcoholic extract was added to 5-10 drops of dilute HCl followed by a small piece of Zinc. Formation of pink or radish pink color precipitate indicated the presence of flavonoids. Test of glycosides: Small amount of alcoholic extract in 1 ml water was added to aq. NaOH. Formation of pale yellow precipitate was due to the presence of glycosides. Test of resins: Small amount of alcoholic extract in 5 ml acetic anhydride was added to 0.05 ml of sulphuric acid. Formation of bright purplish red color indicated the presence of resins. Test of saponins: A drop of NaHCO3 was added to 5 ml of aq. Extract and shaken vigorously and left for three minutes. No honey comb like froth was formed indicated the absence of saponins. Test of tannins: 1-2 ml aq. 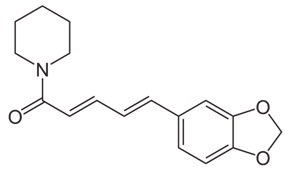 Extract was added to a few drops of FeClFormation of bluish black color indicated the presence of tannins. Different types of chromatographic techniques such as column chromatography (CC), thin layer chromatography (TLC) and preparative thin layer chromatography (PTLC) were used to separate the different component from the extracted compound. Thin layer chromatography was prepared using on glass plates (20*5cm.). The glass plates were cleaned with soda water to remove greasy substance, washed with distilled water and acetone. The clean glass plates were dried in an electrical oven and placed on a thin layer chromatographic template. The plates were tightened with the lever and the spreader was placed in position. A suspension of silica-gel GF 254 60 FLUK (30 gm. in 65 ml distilled water for 22 plates) was transferred to the open spreader set at 0.25 mm thickness. The spreader slotted through with the suspension was speeded over the glass plates and thus a uniform layer was deposited on the plates. The plates were then allowed to stand for twenty four hours for drying and were finally activated by heating in an oven (110°C) for 20 minutes. The activated plates were kept in a desiccator on a drying rack. The sample solutions were applied on the TLC plates with glass capillaries at about 2cm. above from the bottom. The spotted plates were dried and then immersed vertically in the chromatographic tank containing the solvent in such a way that the spotted mark of the samples remained above the solvent surface. The tank containing developing solvent and the atmosphere inside the tank was saturated with the vapor of the same solvents. The plates were developed through ascending technique and finally removed when the solvent front reached from about 2cm. apart from the top of the plates. The plates were allowed to dry and the sample spots were made visible either exposing it to UV lamp or iodine vapor or by spraying with suitable spray reagents. If it is not visible in the day light. An attempt was made to separate the components of the petroleum ether extract using column chromatography with silica gel (60-120 mesh) as stationary phase. The eluted components were examined by thin layer chromatography on glass slabs using kieselgel 60G (E.Merck) as stationary phase. The waxy solid (PEE-7) 520 mg. was a yellow color, soluble in methanol, benzene, chloroform and ethyl acetate. TLC examination in petroleum ether showed one major spot at Rf 0.3 with minor impurities near base line. It was then purified by passing through a small column of silica gel made in petroleum ether and eluted with the solvent system given in the Table 2. Fraction (PEE-7)2 b (18 mg.) showed a single spot at Rf 0.30 in petroleum ether (40-60°C): ethyl acetate. The compound was washed by petroleum ether (60-80°C). It was a white waxy solid and melted at 126-127°C. The compound was soluble in chloroform, hot methanol, and ethyl acetate and partially soluble in cold methanol and acetone (insoluble in water). Then it was designated as PC-1. 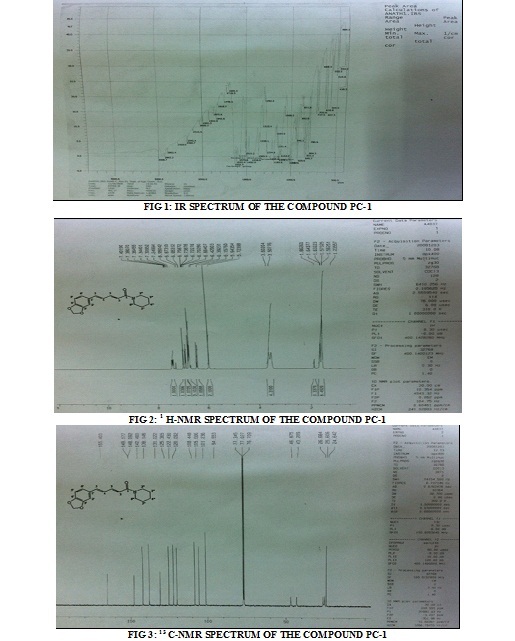 IR, 13 C-NMR, 1 H-NMR spectral data were taken for proper identification and characterization of the compound PC-1. The petroleum ether extract was fractioned into components by using the technique of column chromatography and preparative thin layer chromatography. One single compound PC-1 was able to be isolated from this extract. The isolated compound was purified and characterized by spectral analysis. Physical state: The compound PC-1 was white needle like crystal. Solubility: It was soluble in methanol, chloroform and acetone and also partially soluble in petroleum ether. The 13 C-NMR spectrum (Table 3) of compound PC-1 showed 17 signals including fine aliphatic methylene, three aromatic carbons, four aliphatic methane and five quaternary carbons and methylene di-oxy group. The down field signal at δ 165.4 was probably due to carbonyl carbon at PC-1, the signals at δ 105.6, 108.4 and 122.4 indicated the presence of aromatic ring in the molecule. The signals at δ 43.2, 26.7, 24.6, 25.6 and 46.8 suggested the presence of piperidine ring in the molecule. The 1 H-NMR data of compound-1 (Table 3) revealed the presence of a heteroatom bearing methylene (δ 5-9), three methylene protons (δ 1.5, 1.6 and 1.5) as multiples and (δ 3.5) protons in the piperidine ring as the double doublet. The two double bonded protons (Overlapping multiples), were at δ 6.4 and 7.3 ppm, which indicated the aromatic ring protons (between δ 6.8 and 6.4 ppm). The other two vinyl protons (J- and δ-) were overlapping with one of at the aromatic ring protons. Due to small amount of sample, the other spectroscopic analysis along with mass spectrum were not carried out. The above mentioned spectral data which consisted with reported data the compound (PC-1) under examination was identified probably as Piperine. CONCLUSION: Piper chaba belongs to the genus piper and family piperaceae and is locally known as Chui. Different parts of the plant are being used for the treatment of different diseases. All part of the plant are being used for the treatment of different diseases. Every part of the plant like roots, barks and leaves contain various compounds like alkaloid saponin, ester, sugar, steroids, acid and minerals. Fresh stem of piper chaba was extracted with petroleum ether (60-80°C). Then the extract was triturated with chloroform. The petroleum ether extract (PEE) was then chromatographed and rechromatographed over a column of silica gel (mesh 60-120) leading to the isolation of one pure compound, PC-1. It was characterized by TLC coupled with IR, 1H-NMR and 13C-NMR spectra. In antibacterial screening petroleum ether, ethyl acetate, chloroform and methanol extracts exhibited mild to moderate activity against most of the tested bacteria except shigelladysenteriae. On the other hand all these extracts of piper chaba stem and leaves were found inactive against the fungi tested. ACKNOWLEDGEMENT: The research work was investigated in the Pharmaceutical and Organic Research Laboratory, Department of Applied Chemistry & Chemical Engineering, and University of Rajshahi. I am grateful to all respectable members of Central Science Laboratory University of Rajshahi for their cordial help and constant activities during analysis time. I am also grateful to all respectable and responsible members of BCSIR (Bangladesh Council of Scientific and Industrial Research) laboratory, Dhaka for assisting to achieve the goal of this study. Haque R. M.Sc. thesis, Department of Pharmacy, Rajshahi University, Bangladesh, 2000. Ahmed M.S. Ph.D thesis. H.E.J. Research Institute of Chemistry, Pakistan, 2002. Patil RC, Manohar SM, Upadhye MV, Katchi VI, Rao AJ, Mule A and Moghe AS: Anti Reverse Transcriptase and Anticancer activity of stem ethanol extracts of Excoecariaagallocha(Euphorbiaceae). Ceylon Journal of Science (Bio. Sci.) 2011; 40(2):147-155. Bag A, Bhattacharyya SK, Pal NK, and Chattopadhyay RR: In vitro antibacterial potential of Eugenia jambolana 27seed extracts against multidrug-resistant human bacterial pathogens. Microbiological Research 2012; 167:352-357. Md. Islam S, Roy AC, Md. Hossain S and Sayeed MA: Phytochemical Studies on Piper Chaba Hunter. Int J Pharm Sci Res 2015; 6(6): 2525-31.doi: 10.13040/IJPSR.0975-8232.6(6).2525-31.